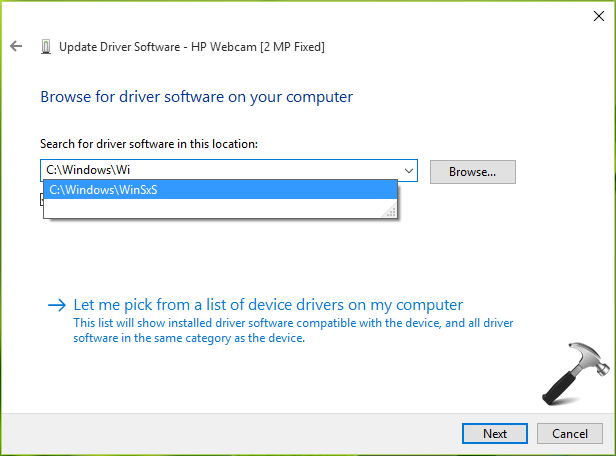 If you cannot update device drivers due to "Windows encountered a problem installing the driver software for your device" error in Windows 10, fix it here. If running this troubleshooter makes no differences in the situation, go for FIX 2. 2. In the Device Manager window, right click on the device with which you’re facing the issue and select Update Driver Software. 3. 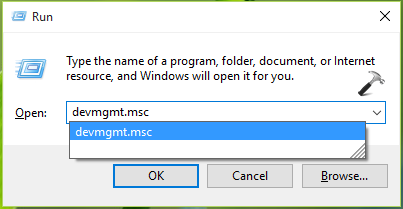 Next, in the update wizard, choose Browse my computer for driver software option. 4. 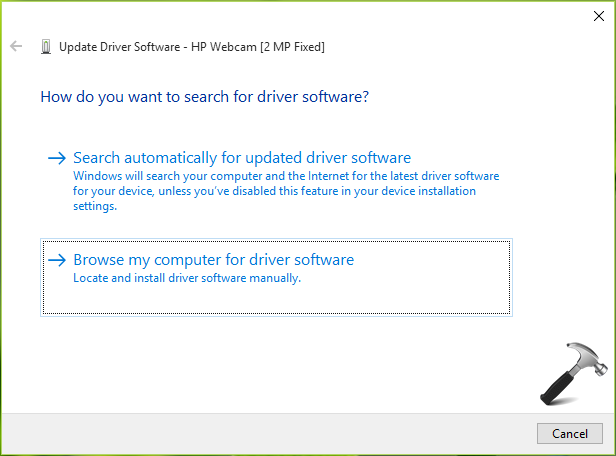 Then in next screen, in Search for driver software in this location input box, type C:\Windows\WinSXS. Click Next. 5. Now Windows will begin the search for update driver in that location. This may take a while but will fix the issue for your device. 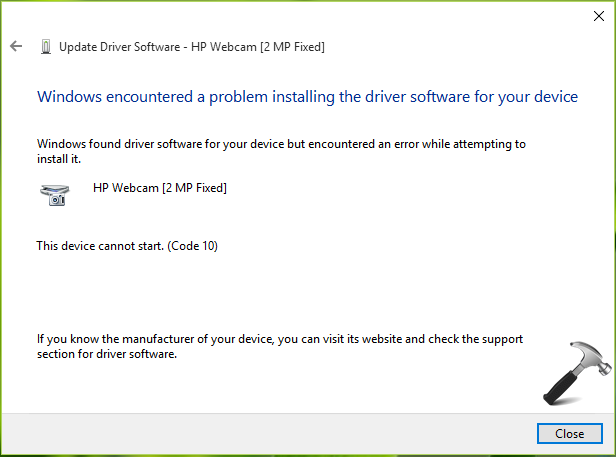 You can then retry to update the driver as usual and it would work without any errors. Awesome, Worked like a charm!!! Thanks a lot Kapil. You are a life saver. Thank you bro. The best solution than I found. ^^ Very nice, thanks for feedback! i spent about one week trying to get my lumia 535 phone connected to my pc but all to no avail. with this info., i spent just a minute and I am done. thanks once again……. A BIG Thanks to you bro.. I was working on it from last few days… finally problem got solved by ur help..
once again THANK U SO MUCH..
you know what is the problem with my pc it shows a kind of a warning sign (it is a yellow triangle with a ! inside of it)and when i wanna update it doesnt say error 1 it says The data is invalid please help i really need to fix this fast! Is this gonna work with Display Adapter>Unknown Devices? I have spent hours trying to fix this. Microsoft assistance was not helpful. Found this today after countless searches. Fixed it first time. Thank you so much! After once changing a new laptop for another new laptop and now after having this one, shy of two months, the audio stopped. Went through chat with LG and I was directed here. After trying your plan B, it worked immediately. Now I can continue with my Español lessons. Muchas gracias! ^^ Glad to see, it helped you Alicia! This worked perfectly. I had a computer crash recently and I was having all kinds of problems with drivers. I could not even get a Microsoft branded wireless mouse installed until I found this article. I realize Im am a year behind, but if you see this comment can you explain why this failure occurs? I would think it should direct itself to this folder so Im curious if its just code error, maybe something I did or what. I thought it was me adding a 500GB SSD drive maybe, but the computer has run with that for the last year with no issue until it crashed. Funny the whole thing actually crashed when I was pairing a bluetooth Xbox remote in the first place. ^^ Glad it helped, Mike! ^^ Glad it helped you! This is sandeep. Sir i tryed the same sollution But its still not working for me. The operation returned because the timeout period expaired. It shows like above line. This Solved my problem, Thank you very much!!! Details- after an unexpected power failure the keyboard and mouse would not work on my Windows 10 Desktop PC. I was able to plug in an old PS/2 style keyboard and that worked, but many tries updating/deleting/updating drivers could not get my USB keyboard or mouse to work. Many internet searches I found nothing. I rolled back to a checkpoint didn’t work and I was just about to reinstall windows when I came across your solution. Used your windows/sxs suggestion to manually updated the driver for the keyboard and mouse and a quick reboot and everything seems to be fine. Again, thanks for your help, this saved me days of reloading and configuring software. ^^ Thank you very much for your feedback! After MANY hours/days of searching for and trying various things to solve my “USB controller drivers not found”, even paying for driver software that did not help,..YOU PROVIDED THE FIX!!!!!!!!!!!! How can I send you a few bucks? My Microsoft mouse 1000 suddenly stop working, although the keyboard using the same USB micro receiver was still working fine. On another machine both worked perfectly. I tried uninstalling / reinstalling driers and every suggestion I could find online – nothing worked. Finally I found your article and it worked! !